Washington St. heading toward Rt. 9 and Boston. 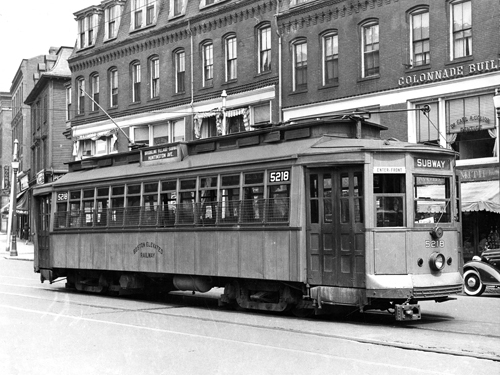 This is a Type Four car, in use in Boston from 1911-1950. The two brick buildings still stand. Earl Colvin, dentist, is the clearest. He was at that location (221 Washington Street) as early as 1922 and as late as 1940. In 1944 he had moved to 1 Harvard Street. Moore's, up the street, is Moore's Grille at 6-9 Harvard Square. Wolf & Smith, Meats. They are beneath Colvin and the name is only partly visible. They were there as early as the 1920s through at least 1944. Elisabeth Cleansing Shop. The name is on the corner above the back of the trolley. Daniel Goldberg. His name is on the window next to Grennan, but we don't find him in the city directories.